1. Angle Interface (A36) – The Angle Interface offers the most adaptability for customers. Either of the perpendicular surfaces of the angle may be bolted or clamped to. The standard length is 36 inches with six bolt holes. The standard finish is clear zinc plate. The A36 Angle is bolted to the P15 Mounting Plate and may be removed if the customer desires to mount directly to the P15. 2. Mounting Plate Interface (P15) – The Part-to-be-handled can be easily bolted to this flange type interface. The standard size is 11″ x 15″ with an eight-hole bolt pattern spaced at 13.5″ x 6″ centered on the plate. The eight holes will accept up to ½” diameter bolts. The standard finish is clear zinc plate. 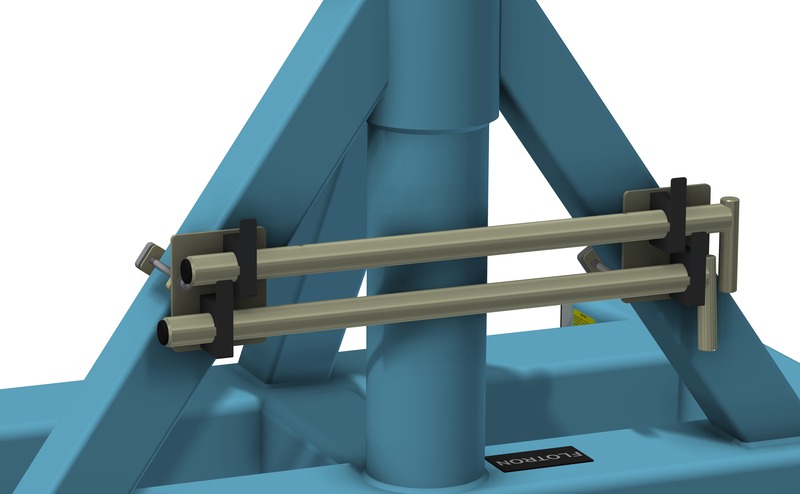 4 bolt-on Leveling Jacks allow for leveling of load while in a stationary position. Code J0, which is not shown, is for jack mounting plates only but does not include Jacks. The J0 option allows for future addition of Jacks. Code J2 includes Jacks. The Jacks have 1″ of rise for each 14.6 turns of the crank handle. JACK has 2.3″ (5.8cm) nominal ground clearance when retracted and 3.7″ (9.4cm) nominal raise when extended. Vertical bars are mounted on the sides of each end frame to aid in pushing and steering the fixture during short intra-facility moves. The combination of having swivel locks engaged on the rear casters and bars for pushing and steering can make a huge difference to ease transportation. 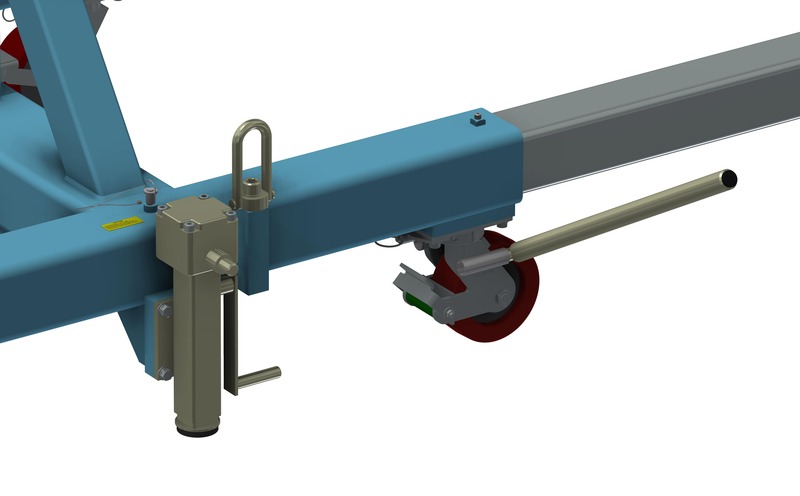 When the push bars are not in use, they can be lowered 18” so they are not in the way of assembly or test operations. The 900 series also comes with a standard towbar for transportation over longer distances. The frame mounted push bars can be retrofitted on existing Flotron Rotation Fixtures. If a standard Holding Fixture does not meet your requirements, contact FLOTRON about custom modifications. Often minor modifications to a standard unit are all you will need and can be done cost efficiently. See here for past examples of our Modified Standards and Custom Solutions.